The Pacific Coast of Mexico along the state of Jalisco, is a richly diverse coastline with large and small bays – beaches, and a variety of sparsely populated communities between the larger towns and cities. Cabo Corrientes just south of Puerto Vallarta is where the Costalegre actually begins. Costalegre means “happy coast”, and it is indeed that. It will put a smile on your face when you see some of the remote and pristine beaches it has to offer. There are isolated little coves of sand and grand expanses of beach that stretch for as far as the eye can see. There is a diversity of flora and fauna that ranges from tropical to dry and arid, and high bank oceanfront with rocky cliffs at waters edge, to flat almost dune-like no bank beachfront. There are lagoons that form where rivers outlet against the beach and find a place to break through to the ocean during the rainy season. Birds of many varieties populate the coast, and some are unique to only this area of Mexico. Marine life is still abundant off the coast from Cabo Corrientes and to the south of Jalisco. Much of this remote area is also home to nesting sea turtles that return annually to lay their eggs on the beaches. All of this is why this area is so special and why it appeals to those who want to escape the usual convenient tourist destinations. 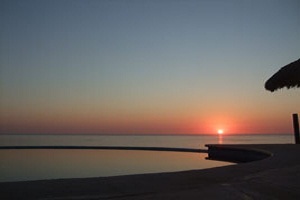 Imagine sitting on a beach that seems to go forever, watching the sunset into the ocean, and no one else is around. Perhaps a morning walk, as the first rays of sun warm the sand under your feet. Add a little creature comfort. Perhaps some fresh fish for lunch or dinner, maybe something that you caught. Find a setting with the ambiance that suits your style, and you might not want to go back to whatever you do in real world time. When you do, you will feel refreshed, inspired, and probably planning your return. Access to some of the best is just now improving with the surfacing of what once was a seasonal dirt road from the town of El Tuito to the Mayto area. 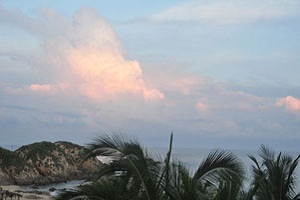 The Mayto area affords access to beaches to the north of Cabo Corrientes as well as south to Tehuamixtle and Villa del Mar and beyond to La Cruz de Laredo. There are a handful of lodging options at this time, ranging from economy – budget to mid-range, mostly in the Mayto area, with one very private high-end place near La Cruz de Loreto. I am thinking about a chilled glass of white wine accompanying a wonderful ceviche – on the terrace at Casa J, Chachalaka, over looking the ocean as the sun is setting.